Sean (Ryan Guzman) and The Mob dance crew moved to LA to pursue their dance careers after their success in Miami. After not faring so well in auditions, and a dance battle in a club, which they lose miserably, Eddy (Misha Gabriel Hamilton), and most of the crew decide to move back to Miami, leaving Sean alone in LA. Sean hooks up with Moose (Adam G. Sevani), who gets him a job at his grandparents’ dance studio and gives him a place to stay. Sean mentions to Moose there is a dance competition in Las Vegas, called The Vortex (think The Hunger Games of dance), that could win them a 3 year dance contract. Moose is reluctant to go back to his old dance crew days, but eventually gives in. Moose introduces Sean to Andie (Briana Evigan) and, after a dance battle at Andie’s photo shoot, the three of them decide to put together a new crew to take on rival crew The Grim Knights and all the other crews at The Vortex. When The Mob shows up at the competition, and members of Sean’s new crew hear some controversial information about the competition, things get complicated. As I’ve stated before, the Step Up franchise is one of my guilty pleasures. I can’t get enough. Or maybe I can. After Step Up Revolution, I mentioned that it would be hard for Adam Shankman and crew to top the latest installment. That they should have stopped after atoning for the atrocious Step Up 3D, while they were on top. I stand by that prediction. We have reached the point where Step Up has reached its peak and has nowhere to go but down. These movies show us that violence isn’t the answer. All of the world’s problems can be solved by dance. Unless those problems involve a less than stellar script, a predictable plot, and an overload of dance battles. Yes, I realize the point of these movies is to showcase the dancers in battles, but it gets to the point of ridiculous. Instead of fighting when rivals get in their face at a club, The Mob attempts to resolve the issue by dancing at the Grim Knights. And the Grim Knights think this is a suitable solution. Maybe this is typical behavior in LA. I don’t know. What I appreciate is that Step Up gives the kids who appear on So You Think You Can Dance a chance at a career. If you watch the show, you will recognize a lot of faces. Adam Shankman also pulls a Stan Lee and gives himself a minor cameo, just because he can. I also appreciate giving a nod to the previous movies in the franchise. Everyone who is anyone in a Step Up movie has a role in the movie. Everyone except Channing Tatum and Jenna Dewan-Tatum. Apparently, we are meant to dismiss the first movie entirely. Including Channing and Jenna would have been the only thing that could have redeemed All In. 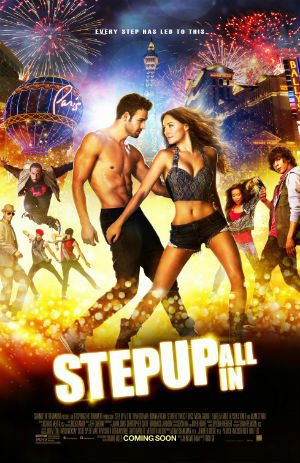 I am going to file this Step Up movie with Indiana Jones and the Kingdom of the Crystal Skull. It is not canon. In fact, it never happened. Honor the greatness of Step Up, episodes 1, 2, and 4, and skip this latest installment.